Hear the author Fred Harrison interviewed on the Renegade Economists tomorrow. Make sure you are podcasting us so you never miss the show. Fred Harrison’s new book levels some very serious charges at the current leaders of the poverty industry. The good intentions, the money, the rhetoric, the pity and the media histrionics are but a pinpricks to a world rampaging monster. 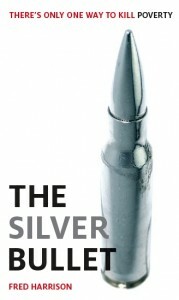 They say there is no silver bullet. It takes Harrison’s razor sharp pen few words to zero in on the limitations of Joseph Stiglitz, Naomi Klein and Jeffrey Sachs. Economics is a damaged social science because its exponents fail to work with comprehensive models of the real world. As our understanding of the Silver Bullet grows, so does respect for the level of investigative reporting in the very readable 179 pages. Insights to Zimbabwe’s plight, China’s growing elite and even the Kalahari Bushmen are viewed through the lens of land rights and the reform needed to encourage their ‘creative energy’. The reports Harrison unveils give us hope that academics are wary of rent seekers. A stunning insight into the failure of colonialism threads its way throughout the book. Poignant is the analysis of India and the varying methods of revenue raising that were imposed on its’ regions and how this still influences them today. Those areas where rents were recycled into improved infrastructure are now the dominant economic forces.